I’m very pleased to announce the latest Steam Punkie book is now available for sale on Amazon. Fed up of A is for apple? Then this alternative alphabet book might be a refreshing change. 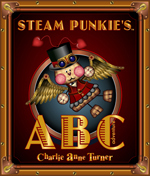 Steam Punkie goes on an alphabetical adventure encountering an alien attack on the way. Luckily, he has invented a number of steampunk gadgets which help him get out of all sorts of situations. Click here to view this book on Amazon. Or click here to goto the Steam Punkie website.